A really interesting image in its way. 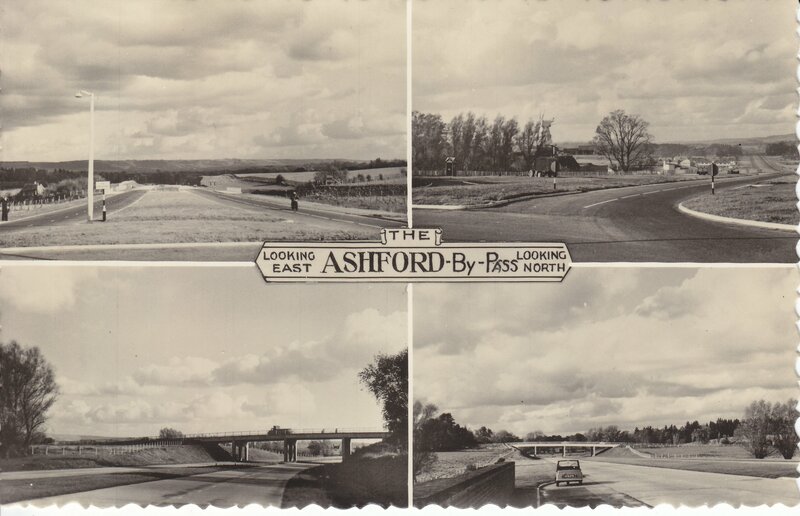 The four views show the old Ashford Bypass which is now part of the M20 motorway and Simone Weil Avenue. Top left is a view from the town end at what is now known as Drover's Roundabout. This is looking towards Willesborough. You can see the two carriageways, left toward Willesborough, right from. Top right is from the other end, in Willesborough, looking north towards the Drover's Roundabout. Bottom left shows the Bybrook bridge, looking south and bottom right is the other side of the same bridge, looking north. Click the image to zoom and see some good detail.